As Approved by the Wianno Senior Class Committee, July 13, 1984. Including all Amendments through November 16, 2018. 1. Description of Scudder Cup. The Frederic F. Scudder Memorial Trophy, the H. Manley Crosby Memorial Trophy and the Ross W. Richards Memorial Trophy (the “Scudder Cup Prizes”) are awarded annually by the Wianno Senior Class Committee to the skippers of Wianno Seniors having the three highest scores following the six interclub races sponsored by the Bass River, Edgartown, Hyannis, Hyannis Port and Wianno Yacht Clubs and identified as Scudder Cup Races in the Schedule of Events published by the Class Committee (referred to in these Rules as the “Scudder Cup Races”). If less than three Scudder Cup Races are completed, the Scudder Cup Prizes will not be awarded. If a sponsoring club schedules a second race for the afternoon on which any Scudder Cup Race was previously scheduled, the second race, if sailed, shall be counted as a Scudder Cup Race. If the race normally scheduled for Friday afternoon of the Edgartown Regatta is abandoned or cancelled and a special make-up race is scheduled for the following Saturday morning or afternoon, with adequate notice of the make up race posted on the Edgartown Yacht Club Race Committee Bulletin Board, such race, if sailed, shall be counted as a Scudder Cup Race. Except as provided in paragraph (b) only races which start after 12:00 noon will be counted as Scudder Cup Races. 3. Helmsman. There is no restriction on the number of helmsmen. Each helmsman must be a member of the Wianno Senior Class Association.SMSA or a yacht club affiliated with SMSA. Other persons may steer a yacht briefly during spinnaker sets, repairs or in similar situations. 4. Measurements. In order for a yacht to be scored as a competitor in a Scudder Cup Race, the yacht and its sails must conform to the Wianno Senior One Design Rules dated April 19, 1985, and to all amendments and interpretations issued subsequently by the Wianno Senior Class Committee. (a) The scores for each tied yacht shall be listed in the order of best to worst, and at the first point where there is a difference, the tie shall be broken in favor of the yacht with the best score. (b) If a tie remains between two yachts, it shall be broken in favor of the yacht that scored better than the other yacht in more races. If more than two yachts are tied, they shall be ranked in order of the number of times each yacht scored better than one or more the other other yachts. If a tie still remains, this rule (b) shall be applied to the tied yachts until all ties that can be broken are broken. (c) If a tie still remains between two or more yachts, they shall be ranked in order of their scores in the last Scudder Cup Race. (d)Special Scoring Procedure for Yachts Not Equipped with Currently Approved Sails. All yachts equipped with Wianno Senior mainsails, jibs and spinnakers designated in accordance with Section VI of the One Design Rules must use such sails in all Scudder Cup Races. Yachts not equipped with such Wianno Senior sails may use other sails, approved for use in the Scudder Cup Races in accordance with procedures or rules in effect during prior years. Although such yachts will not qualify to win the Scudder Cup, they will be scored as participating in the Scudder Cup Races provided in that such yachts use no more than one mainsail, one jib and two spinnakers in the Races. The Scudder Cup Prizes will be presented to the top five yachts carrying mains, jibs and spinnakers allowed under Scudder Cup Rule 6. A yacht’s score will not be altered because of the type of sail it carries. (a). Mainsail and Jib. During the Scudder Cup Races, a yacht may use no more than one mainsail and one jib, each of which shall be an approved Wianno Senior sail designated in accordance with Part VI of the One Design Rules. (b). Spinnakers. During the Scudder Cup Races, a yacht may use no more than two spinnakers, each of which, except as provided herein, shall be an approved Wianno Senior sail designated in accordance with Part VI of the One Design Rules. Notwithstanding the foregoing, a yacht which is not equipped with such an approved Wianno Senior spinnaker may use up to two spinnakers approved for use in the Scudder Cup Races prior to August 31, 1990 in accordance with Scudder Cup Rules in effect at the time of such approval, provided that a yacht shall not be permitted to use a spinnaker designed primarily for reaching. (c). Limits on Purchases. A Scudder Cup participant may purchase no more than one mainsail following January 1, 2018, and no more than one spinnaker each year following January 1, 2008, provided, that, in the event a yacht owned by a Scudder Cup participant is not, prior to January 1, 2008, equipped with at least one Wianno Senior Spinnaker designated in accordance with Part VI of the One Design Rules, then the owner of such yacht may purchase two spinnakers following January 1, 2008. A Scudder Cup participant may purchase no more than one jib each year. (d). Substitutions. A Scudder Cup participant may substitute a sail only in the event of severe damage which cannot be repaired prior to race time upon application to the Class Committee. Any two members of the Class Committee shall have the authority to permit the substitution of a sail upon such terms and conditions as such Committee members shall deem reasonable in the circumstances. 7. Sail Numbers. A yacht competing in the Scudder Cup races shall have as its sail number the hull number assigned to such yacht by its builder, provided, however, that the foregoing restriction shall not apply to sail numbers in regular use prior to the 1987 season. A yacht owner shall be entitled to use his yacht hull number as a sail number notwithstanding the use of such number by another yacht owner. Conflicts arising from the use of the same number by two competing yachts shall be resolved by the Class Committee on a case by case basis. 8. Haulouts. A yacht competing in the Scudder Cup races may not be hauled out of the water between Scudder Cup Races except for the sole purpose of repairing damages upon approval of any two members of the Class Committee provided that no work will be permitted during any such haulout other than repairs to the damaged area. However, due to the limits on the availability of in-water moorings, the Class Committee shall have the authority to permit, on a case-by-case basis, a yacht to be hauled and stored out of the water between Scudder Cup races. It is expected that such a yacht be provided with suitable anti-fouling paint so as to not provide an advantage over yachts stored in the water. 9. Crew Limit. In order to qualify for the Scudder Cup Races, a yacht may carry no more than four crew members (including the helmsman) in any of the Races. The following guidelines have been prepared by the Wianno Senior Class Committee for use by Clubs sponsoring or managing races Scudder Cup Races. The Committee respectfully requests that race committees follow these guidelines to the extent possible. However, these are only guidelines and not part of the One Design or Scudder Cup Series Rules. 1. Sailing Instructions. Each Yacht Club should provide yachts with Sailing Instructions. The sample provided in the U.S. Sailing rule book should be followed as far as practical. 2. Courses. Windward- Leeward courses are preferred. Courses that start and finish near the middle of the windward leg are not desirable for the large fleets usually racing for the Scudder Cup since the first short windward leg results in too many boats arriving at the windward mark at the same time. On windward-leeward courses, the fleet would like two close together leeward marks (a so-called “leeward gate”) to reduce congestion and improve fairness in leeward mark roundings. 3. Course Length. The course should be set up so as to result in a race of 2 ? 2 1/2 hours. The Class Committee estimates that, in winds over 10 knots, this will require windward legs of about 1.7 nautical miles. 4. Buoys. Large Red or Orange buoys should be used. Local buoys familiar to local sailors but not to visitors should be avoided. 5. Starting Line. Setting a good starting line is the single most important thing the race committee can do to make for fair and fun racing. Extra care should be taken to set the starting line perpendicular to the average wind direction. Some race committees slightly favor the pin end of the line which is acceptable. But too frequently the favoring is overdone and Wianno Seniors, which do not sail as close to the wind as marconi-rigged yachts, are unable to fetch the line on the starboard tack. The result is a mess at the pin end with collisions and impossible protests. A foul tide makes this problem more likely. If the wind shifts after the line is set, the fleet would prefer that the Race Committee postpone the start and reset the line. 6. Racing Area. Courses should be laid out well clear of shallow water, rocks or land so as to minimize the advantages of local knowledge. 7. Starting Signals. With long and crowded lines, signal flags can be hard to see, and so they should be as large and be displayed as high as possible. If practicable, the Class Association Burgee with a 17 inch hoist should be used as the Class flag. 8. Radio Communication. Because of the difficulty in hearing individual recall numbers, use of VHF radios to announce individual recalls should be permitted from the Preparatory Signal until recalls have been announced. The VHF channel to be used should be posted on the Committee Boat. 9. Course Changes. If the wind shifts, it is desirable that marks be moved in accordance with Racing Rule 33. If the wind lightens, shortening course is desirable. Eliminating the last windward leg of “O” or “W2½”is particularly desirable and still leaves a reasonable race. This is one reason “O” and W2½ are recommended. Note that the length of a leg may be lengthened or shortened by signalling “+” or “-” in accordance with Rule 33. 10. Protests. 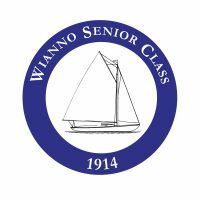 If there is a question of the interpretation of the “Wianno Senior One Design Rules” or “Scudder Cup Rules”, the Race Committee may refer the question to the Wianno Senior Class Committee in accordance with the applicable provisions of the Racing Rules of Sailing. 12. Time Limit. The Sailing Instructions should specify a time limit. The Committee suggests a time limit of 3 1/4 hours for the first boat from the starting signal. No limit is recommended for other finishers. 13. Racing Conditions; Postponements. A race should not be started in fog so thick that finding marks will be a matter of luck, in conditions so light that the boats mostly drift, or in conditions so windy and rough that a substantial number of breakdowns are likely. Postponement to wait for improvement until about 3:30 p.m. is reasonable. 14. 360 Degree Penalty. The Notice of Race and the Sailing Instructions should specify that the applicable provisions of the Racing Rules of Sailing are modified to provide for a penalty of one turn including one gybe and one tack.